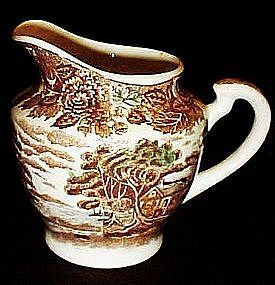 Nice cream pitcher in the Nasco Mountain Woodland pattern. Pretty brown transferware with random waercolor highlights of green, blue and yellow.One teeny fleabite size glaze chip on the inner rim. (had to mention it) Mostly noticeablr to the touch. Measures 4 1/4" to tip of lip.